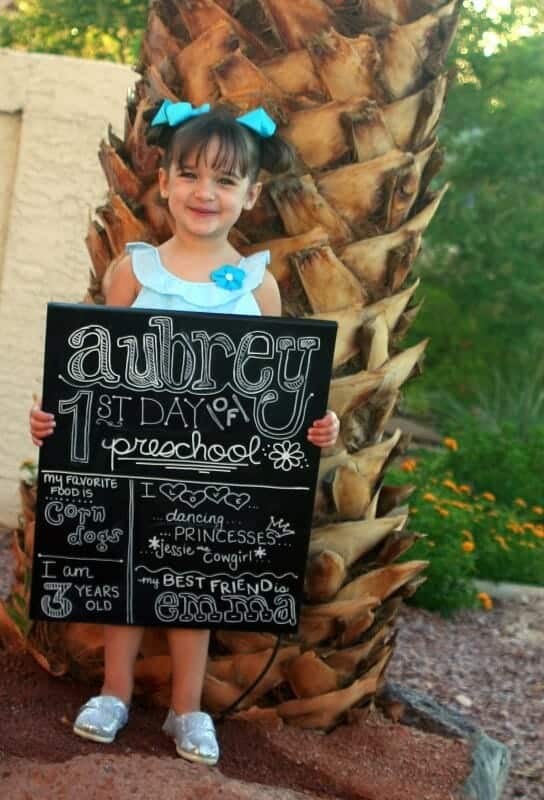 Have you seen all of the ADORABLE first day of school pictures on Pinterest? Where were these GREAT ideas when my kids were little and would still take a picture when I asked them to? 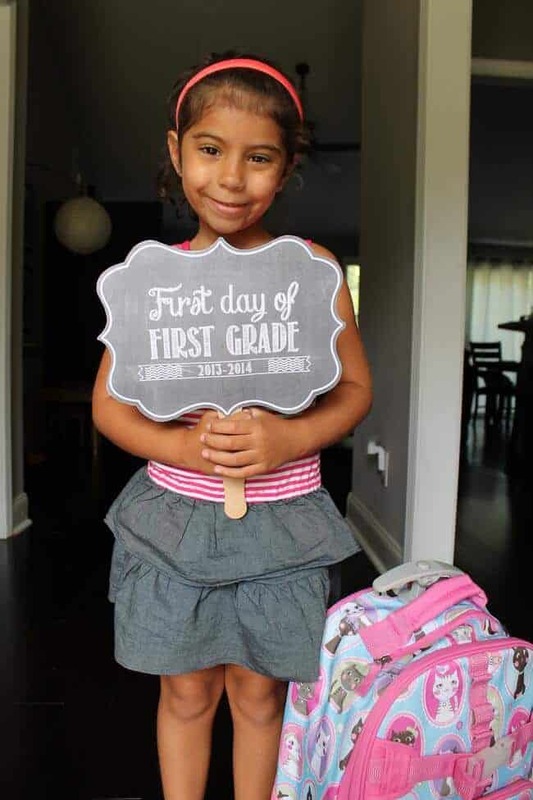 These 10 great first day of school pictures are some of the ways I would have loved to capture these special and momentous days of my kids growing up had I had enough creativity and forethought to do so! 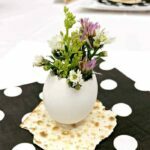 Wanna get creative with your kids school lunches? Your kids will go crazy when they open their lunch boxes and see these Creative School Lunch Ideas! We love taking family pictures too. We have some great ideas for Family Vacation Photos! Oh… and before you know it, your child will be a senior in high school – so we collected some of our favorite Senior Photo Ideas! Photos are the very best way to save memories. Think about the holiday’s…. you get everyone dressed up and you take a picture every year, send out the holiday cards to all of your family and friends! When it comes to the first day of school, I love the idea of doing the same picture every year to truly see how much our kids change from year to year!! 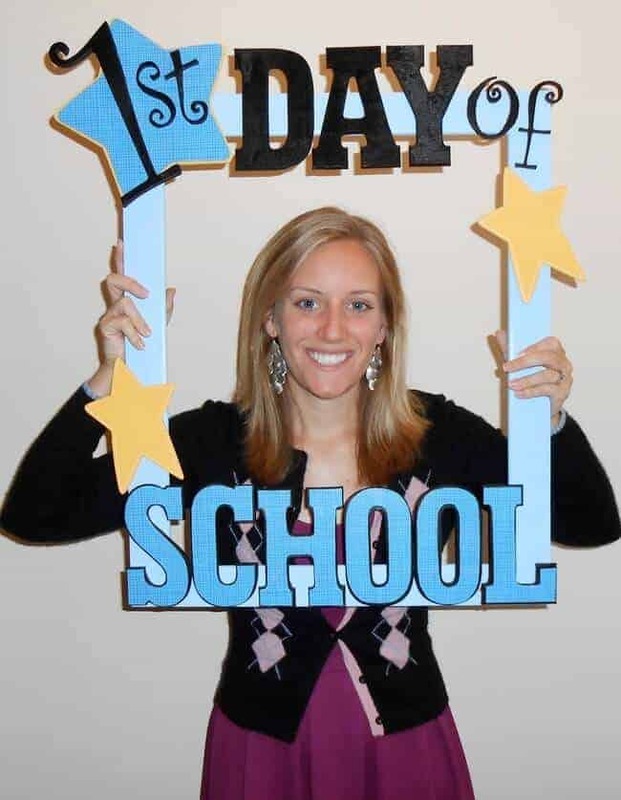 Check out our favorite first day of school picture ideas and click on the link or picture to see how to create these memories yourself!! 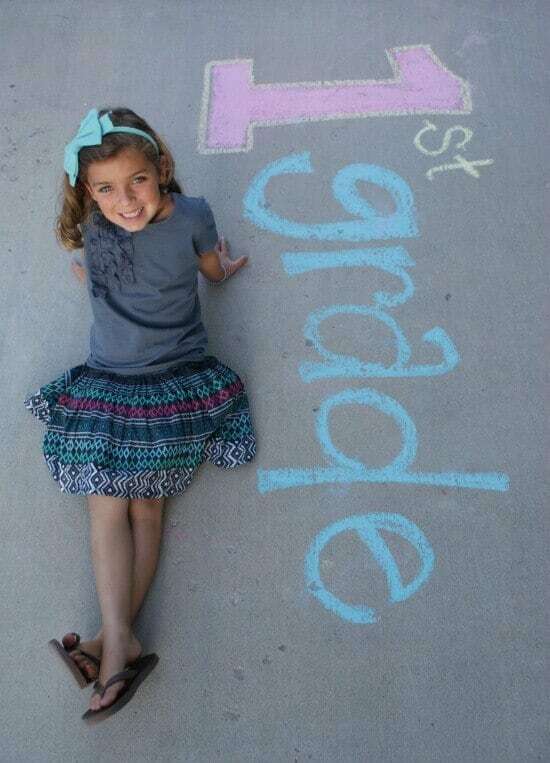 Get creative with chalk from Blue Cricket Designs – this one is not only a super cute photo, but also a great project! We love everything having to do with sidewalk chalk. Have your child draw their idea for their picture on the driveway! 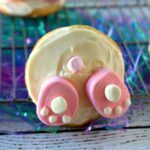 Need a DIY chalk recipe? We have a great one and there are only 3 ingredients!! 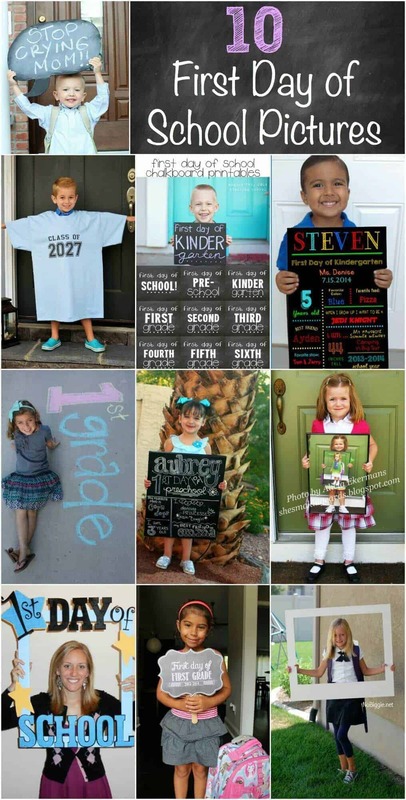 Get this GREAT free printable sign from Oh So Printable – these adorable printable signs make the perfect prop for your first day of school photo! 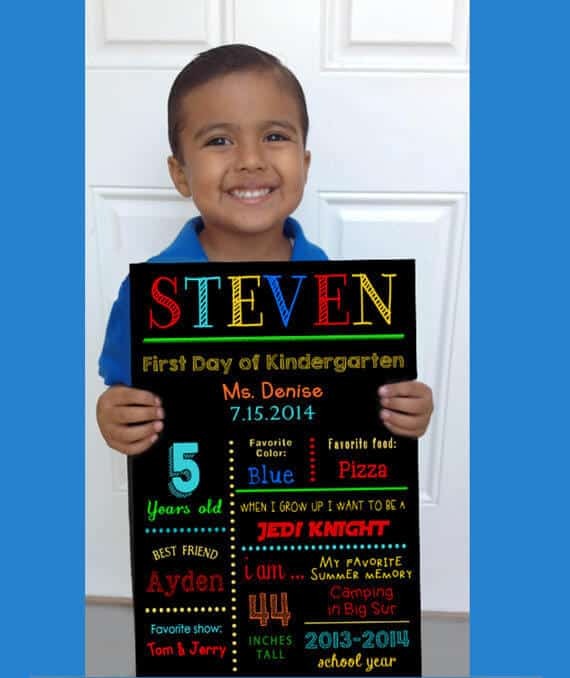 Have your child take a picture in their “graduation” shirt every year from Journey of Parenthood – I love this idea! 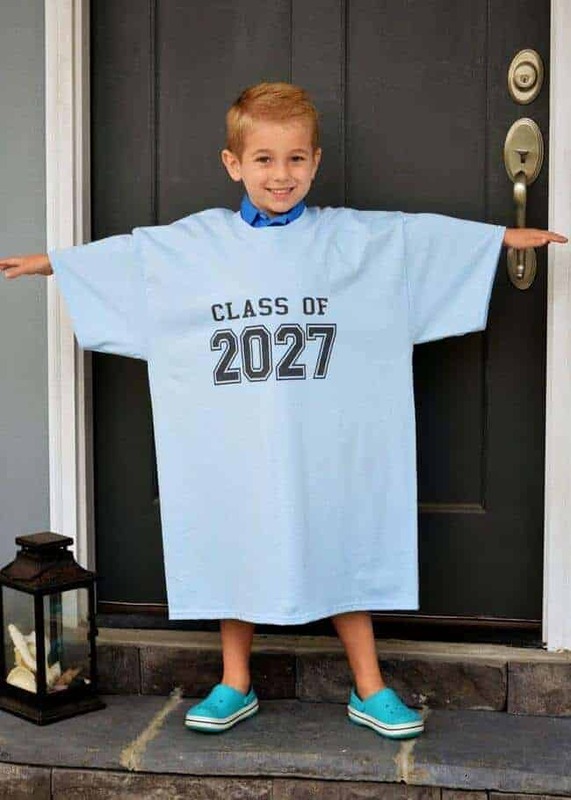 The oversized tee shirt photo is great and as they get bigger, they will grow into the shirt until it is the perfect fit when they are ready to graduate high school – sniff, sniff…it will be here before you know it. Make your own chalkboard sign from Mimis Doll House – a piece of plywood and some chalkboard paint and chalkboard markers are all you need to make this adorable sign. Show how they change and grow throughout the years with not only the photo, but some personal information as well! Print out these great chalkboard signs from Color Me Meg – free printables mean less work and we can all use a little of that! They have them for every grade! So cute! 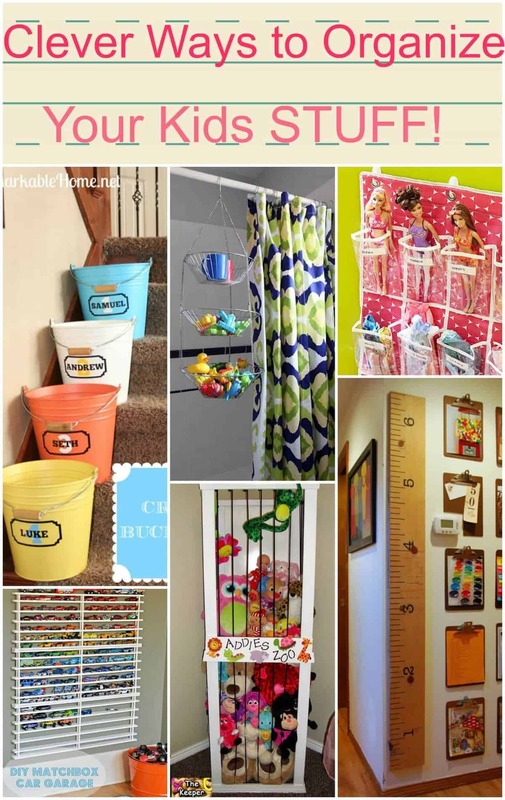 Make a frame with a changeable grade from First Grade School Box – What a cute idea – make them into the frame! 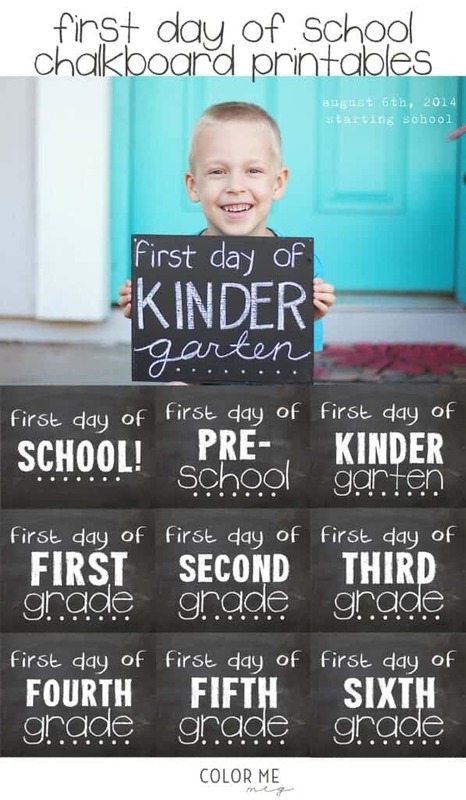 This is also a really great way for teachers to celebrate the first day of school and a good way to learn the kids names! Buy a sign from Etsy from MiBellaDesigns on Etsy Don’t have time to make a sign? You can order a personalized sign here! Make a speech bubble sign from Banana Pancakes Blog – this always makes me laugh! 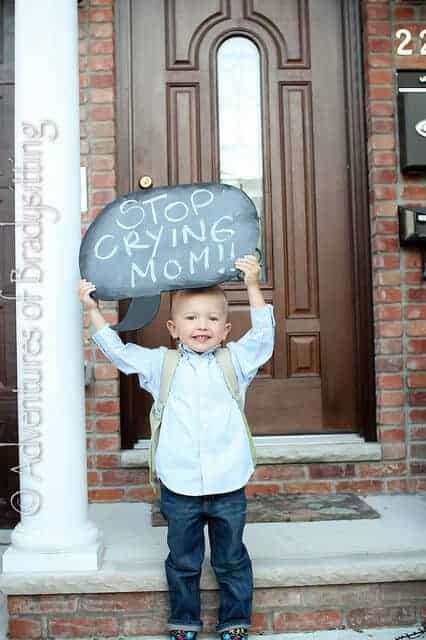 You know that we are all blubbering behind the camera, so why not have a little bit of fun with the first day of school! 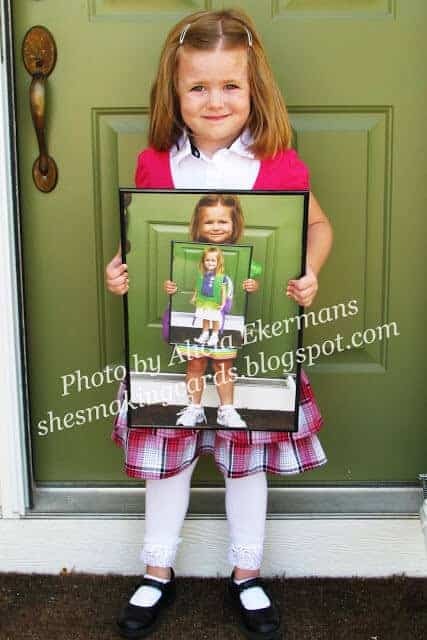 Have your child hold pictures of themselves every year from She’s Making Cards – again, I love to see how they change and this is such a cute idea of talking a photo of them holding the photo every year in front of the same place (just be sure not to move….or bring the door with you! 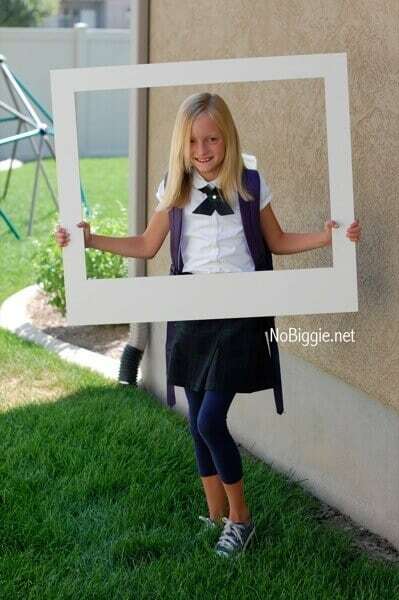 Make your own giant polaroid frame from No Biggie – go retro with this giant retro Polaroid frame! 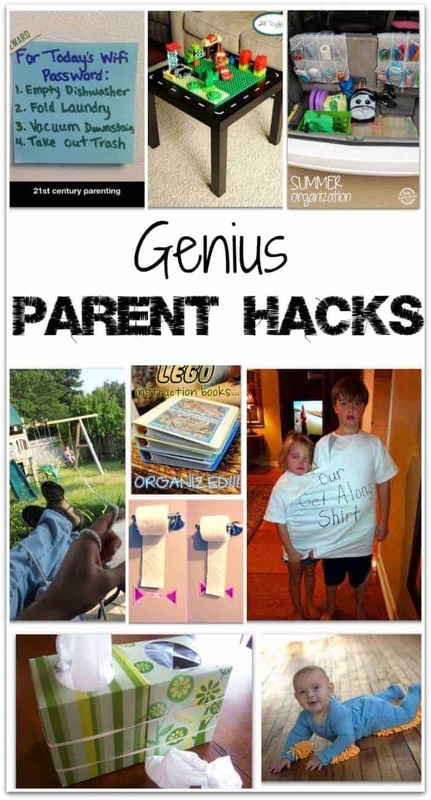 Also – don’t miss one of our favorite posts Genius Parenting Hacks!